Ytterbium atoms have 70 electrons and the shell structure is 2.8.18.32.8.2. The ground state electronic configuration of neutral ytterbium is [Xe].4f14.6s2 and the term symbol of ytterbium is 1S0. Ytterbium: description Your user agent does not support the HTML5 Audio element. 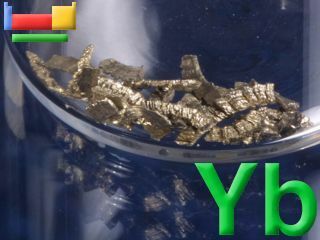 Ytterbium has a bright silvery lustre, is soft, malleable, and quite ductile. While the element is fairly stable, it should be kept in closed containers to protect it from air and moisture. Ytterbium is readily attacked and dissolved by mineral acids and reacts slowly with water. 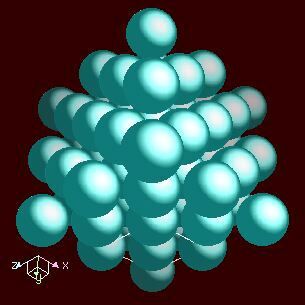 The solid state structure of ytterbium is: bcc (body-centred cubic). Ytterbium has no biological role but is said to stimulate the metabolism. Reactions of ytterbium as the element with air, water, halogens, acids, and bases where known. Binary compounds with halogens (known as halides), oxygen (known as oxides), hydrogen (known as hydrides), and other compounds of ytterbium where known. Bond strengths; lattice energies of ytterbium halides, hydrides, oxides (where known); and reduction potentials where known. Ytterbium was discovered by Jean de Marignac in 1878 at Switzerland. Origin of name: named after the village of "Ytterby" near Vaxholm in Sweden. 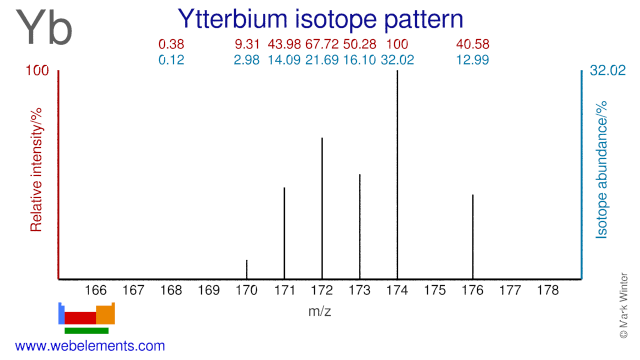 Isotope abundances of ytterbium with the most intense signal set to 100%. Ytterbium has seven stable isotopes and two of them are used for medical and industrial purposes. Yb-168 is used for the production of Yb-169 and this radioisotope is used as a radiation source in gamma cameras. Yb-169 is also used in the medical field where it has been proposed as an alternative for I-125 and Pd-103 in the treatment of prostate cancer while it is also used for diagnostics in the gastrointestinal tract. Yb-176 can be used as a target for the production of carrier-free Lu-177 with a high specific activity. Yb-171 in an excited state has been proposed as an optical frequency standard, while the other Yb isotopes are used in various physics experiments. Isolation: ytterbium metal is available commercially so it is not normally necessary to make it in the laboratory, which is just as well as it is difficult to isolate as the pure metal. This is largely because of the way it is found in nature. The lanthanoids are found in nature in a number of minerals. The most important are xenotime, monazite, and bastnaesite. The first two are orthophosphate minerals LnPO4 (Ln deonotes a mixture of all the lanthanoids except promethium which is vanishingly rare) and the third is a fluoride carbonate LnCO3F. Lanthanoids with even atomic numbers are more common. The most comon lanthanoids in these minerals are, in order, cerium, lanthanum, neodymium, and praseodymium. Monazite also contains thorium and ytrrium which makes handling difficult since thorium and its decomposition products are radioactive. Pure ytterbium is available through the electrolysis of a mixture of molten YbCl3 and NaCl (or CaCl2) in a graphite cell which acts as cathode using graphite as anode. The other product is chlorine gas.